I love the artichoke and spinach dip at Applebee’s so much. It is the one thing on the menu that I just can’t resist every time we stop in for dinner. Instant Pot Artichoke and Spinach Dip Applebee’s Copycat is highly addictive; it is the perfect flavor combination. The garlic, spinach, and artichokes are a classic trio of flavors, and then you add in the different cheeses, and it makes this recipe dynamite. But, I hate having to place a car side to go order or making a trip in every time I get to craving this holy dip. So, I grabbed some ingredients, Instant Pot, and measuring spoons and got to work. 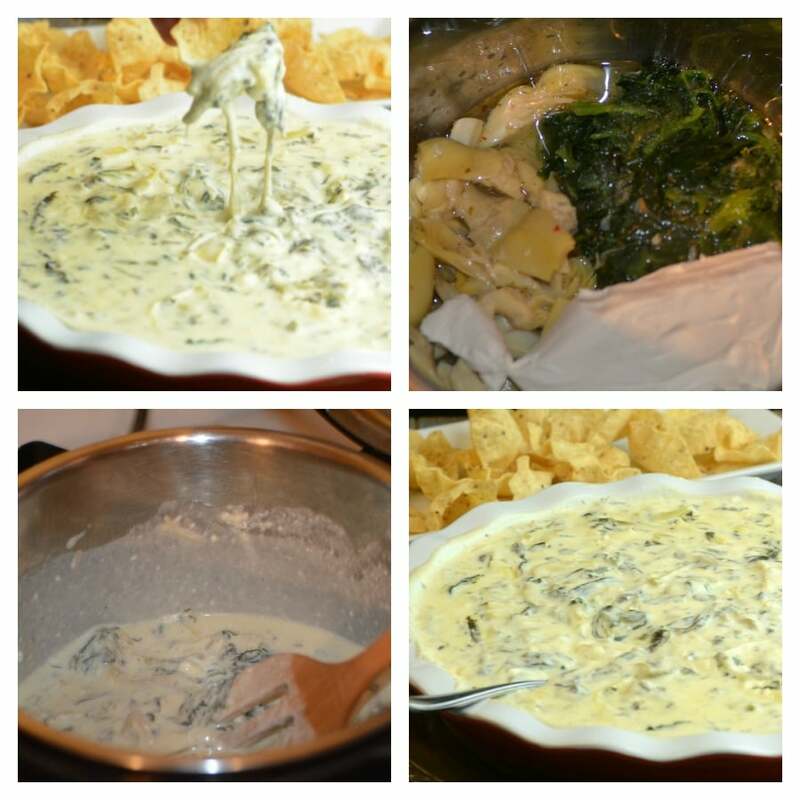 I tested, and tested some more and created this Instant Pot Artichoke and Spinach Dip Applebee’s Copycat Recipe. If you love their creamy dip, then you will love this recipe. I love pulling out my Instant Pot for this recipe because I can whip this up in under 5 minutes. Some readers and friends who have given this recipe a go, come back and tell me they added pasta to the leftover dip for a whole new dish. I can’t believe I had never thought to do that on my own. The next time I make this, and we have leftover, I am sure to give it a try! The winner factors are this dip taste so similar to Applebee’s you no one will know the difference. Last but not least, you can also whip this up, and then lounge on the couch binge-watching your favorite television series or stream Netflix. I am all about comfort and relaxing after a long day, and I don’t always want to be in a crowded restaurant. I love to stay in and just have some calm and quiet after I work, and having copycat recipes that allow me the luxury of delicious dishes like restaurants makes my heart happy and my tummy full. Yes. You will just need to wilt your Spinach slightly beforehand. So in a skillet add a drizzle of olive oil along with your spinach. Allow the spinach to cook down a bit and then let it cool. Then gently try and squeeze out excess liquid before placing in the instant pot. If you enjoyed Instant Pot Artichoke and Spinach Dip Applebee’s Copycat then You will also love my Crack Chicken and Jalapeno and Chicken Hot Popper Dip, Buffalo Chicken Dip all done in the Instant Pot. If you are new to the instant pot and have questions you may want to see Instant Pot Beginners Master the Pressure Cooker. 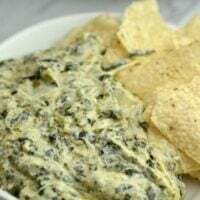 What Ingredients Go Into Instant Pot Artichoke and Spinach Dip Applebees Copycat? You can dip almost anything into this creamy artichoke dip! Salty tortilla chips, crackers, baguettes, pieces of cut up French bread, all work fantastic. Or reach for something lighter like cut up peppers, celery sticks, or cucumbers. Depending on your preference you can dip however you choose! Feel free to reach for light mayonnaise, reduced fat cream cheese to help shave off some calories. You can make this dip ahead of time and store in the fridge until you’re all ready to serve. Then just turn the oven on and heat at 350° or until warm all the way through. Yes! Simply store in the fridge in an airtight container. When ready to reheat warm up in the oven like directed above or pop in the microwave for a quick reheat! I hope you all enjoy this warm dip recipe. I know my family and friends get excited every single time I make it! Have you tried instant Pot Artichoke and Spinach Dip Applebees Copycat? The perfect Dip to bring to any party! Place 3 cloves garlic in the IP with 1/2 cup chicken broth. Drain Artichokes and pour into the pot. Place Frozen spinach, sour cream, cream cheese, mayo and onion powder in the Ip. Place on Manual High Pressure for 4 minutes. Transfer to a bowl and serve with corn chips or bread. This will thicken more as it cools. 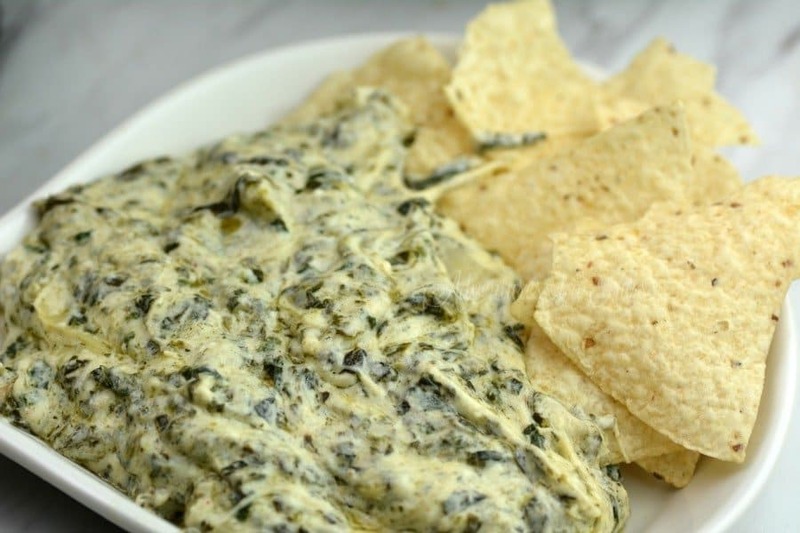 The Instant Pot Artichoke and Spinach Dip Applebee’s Copycat recipe looks astounding. I cannot wait to taste your special recipe. I thank you so much for the directions on this delicious treat. 1 bite = 10,000 calories…..followed by a trip to ER…..
Did you chop the garlic before adding it to the instant pot? Thanks for sharing – it looks delicious! This was great!! I did chop the garlic before adding to the pot. I also added some red pepper flakes before serving! Made this today! Super good. I follow recommendations to 1/2 the Parmesan cheese and it tasted great. I was wondering what the red spice included in your video but not listed as an ingredient. Thanks! In the video you only put in one bag of parm cheese (6 oz) but your recipe calls for 16 oz. which is it? 6 oz of parm or 16 ? Oh my god, I didn’t watch a video. I’ve just asked if that was too much cheese.. I need to read the comments next time. Do you cut up the artichokes or leave them whole? Do you have to thaw and drain the spinach or do you just put it in the pot frozen? There’s a red spice shown in the video that isn’t listed in the ingredients. What is is and how much? Thank you! They were out of frozen spinach. Think I could used canned if I drain it and chop it? Thanks so much for this wonderful recipe. We had a death in the family this morning and I needed something quick and comforting to bring to the family while they visited and mourned. It was much appreciated and so quick too! I didn’t have much left to bring home! A 10 oz. Box of spinach seems like a lot! Is that really how much you used? Can I freeze a portion of this dip for a later time? Maybe use a crockpot to warm up later? I was wondering this same thing. Did you freeze it? If so, did it warm up ok? Does it need to be frozen spinach or can it just be normal spinach? Thanks! Is it 16 oz weighed or 16 oz as in 2 cups? I’m weighing it out and it is a ton of cheese! Thanks for this delicious recipe! I made it for a potluck tonight and I had none left to bring home. It was cleaned out within minutes. I used two six ounce bags of parm and it was still nice and cheesy. I might cut back to just one six ounce bag next time just to be cheap. In your video, there’s a red spice added in. Is that paprika? I can’t imagine it’s cayenne pepper. Has anyone made ahead and froze it or reheated it? When you say 16oz parm and 8oz mozzarella do you mean 2 cups and 1 cup? Seems like a lot if it’s based on weight. Thanks in advance. There was steam in the video when the rest of the ingredients were added. Do you put the garlic and chicken broth on sauté? Also, what is the red stuff? Can this recipe be baked in the oven or crockpot? What is the red spice? Thank you for your feedback ? People keep asking about the red spice. The only artichokes where I am come with the spice on it. It wasn’t added, it came with the artichokes. Did you double broth when you doubled it? I just made a double batch and doubled everything in the recipe. Turned out really thick and cheesy. Very good close to the real applebees but next time i will use WAY less cheese!! I think 6oz – 8oz parm cheese is all you need. Was it a type-o in your recipe?? Do you drain the juice off the artichokes before putting them in or strain them first? In reading the recipe, I do not see instructions on when to add the cheese – parm & mozzerella? In the instructions (not on the recipe note card but above it) it says to stir in immediately after the quick release. It says to add cheese immediately after the QPR. This is listed above in her notes before the recipe page. I don’t like frozen spinach. If I use fresh would I need to add liquid to compensate for this? nope should be the same. Is it really sixteen ounces of Parmesan cheese? I only see you dump in a 6 oz bag in the video. Just curious, did anyone else have spinach that was still partially frozen after the 4 min & QR? I just had to turn it back on for a couple minutes. Yes, mine was still frozen. Next time I will use 1/2 the parm. cheese and cook maybe 2 minutes longer. You didn’t say when to add the cheese? Love this recipe however – just noticed today – the recipe directions don’t indicate when to add the parm & mozz cheeses! ? I tried this tonight bc I was dying for some spinach artichoke dip. It did not thicken, it was basically a ball of cheese surrounded by liquid. Next time I will def. alter the cheese to broth ratio. Flavor was there though! Mmmm. This is so good! Even the cats loved it! The red spice sprinkled on top just looks like crushed red pepper. Can I do this in my crock pot?? I made this for Fourth of July and it was amazing! Thank you! Does the frozen spinach not provide to much liquid after thawing/cooking? Does this need to be served warm or can I make this now and serve it later cold? Absolutely delicious. We loved it. The only modification we will make next time is to add a teaspoon of Tabasco because we like spicy food. Definitely will make again. Thank you!!! Can I use fresh spinach? If so, should I add water? Also, can this be made ahead and heated? I had SUCH a craving for this today. I could not rest until I got to the store and got my ingredients. The funny thing is I don’t like Spinach, Artichokes, Sour Cream or Mayonnaise but when you put them all together in this recipe it is fantastic! I had made this one time before today and its definitely on my list to make for the upcoming Holidays. Thank you for another great recipe. did you chop/mince the garlic cloves? I hope this is the recipe i have looked for, for years!.Someone maxe it at work and this sounds pretty close to the taste i remember. I sure hope do. You have great recipes. I want to make this for thanksgiving, can I make the day before. The flavor is good, but in all honesty the dip wasn’t even warm. My cream cheese was still in a block after the high pressure of 4 minutes. I ended up using the saute function to get it hot and then used the slow cook function to keep it warm. Great recipe! I read through quite a few before deciding on this one. It’s wonderful. I have an 8qt Instant Pot and the burn code appeared so I cancelled and added another cup of broth then restarted. The very bottom was scorched but I had anticipated that so when adding the cheese I avoided scraping the bottom. It was easy to pour into another container thus leaving scorched stuff in the pot. No problemo at all. We decided to put it on baked potatoes for dinner instead of chips or bread although that will happen another time. This time we added steamed broccoli on the side along with a small garden salad. Very filling and all healthy foods filled protein and calcium and vitamins and minerals. I really appreciate that you posted this recipe. My mom & I LOVE this dip! HOWEVER I’m seriously disappointed that you aren’t answering several questions posted here with regards to cold spinach, cheese not melting, etc.. But MOSTLY about the amount of the cheese! Please answer these questions. I note that you are monitoring this post and have answered some of the questions, but NOT the ones I noted. I use organic when I can, and don’t want to ruin this recipe because I put in the wrong amount of cheese. Again, thank you so much for the work you put in replicating the wonderful S/A dip!! Thank you!!! Red spice?, Can it be frozen and reheated?, Amount of parmesan cheese (comes in bags 6oz or container 10 oz). Seems like a typo but not confirmed. Excited to try but would be nice if the most asked questions were answered. Frustrated but glad you shared what should be a delicious recipe! Answering my own questions. No red spice in recipe or video. I made this and it is delicious but too much so I quartered and froze. Take a container out of freezer in morning and cook at 400 for 20 minutes in afternoon. Still delicious and great to know it can be made ahead of time. Did you squeeze the spinach dry? This was delicious! Very thick and creamy. My spinach was still a little frozen when it was done too but I just stirred everything and it was just fine. My question is what is the best way to reheat this dip? Microwave? Instant pot on saute? Crockpot? So easy and a big hit at my party. I used one bag of grated parmesan and a bag of fresh spinach. The spinach filled the instant pot but cooked down and was just right. What can you use if you don’t have an instant pot as you call it? Can you use a crockpot? If so how long ypu let it cook? My spinach was still frozen after 4 min.. will cook longer next time so sad it didn’t turn out. That makes no sense. not sure what happened. I made this tonight. It is excellent! Should the parm cheese by 6oz or 16oz? When I’ve made this the taste is delicious but it is very thick. Thanks for the clarification! Are canned artichokes less vinegary than bottled (I assume pickled?) Used a jar instead of a can once for a recipe, and it turned out terrible. Hi. Reading the IP artichoke and spinach dip recipe and I have a question. One ingredient is ‘16 Oz Shredded Parm cheese ‘. Don’t you mean Grated Parmesan cheese? (In a shaker). Please clarify. Thanks.